Welcome Friends, Family & Guests! 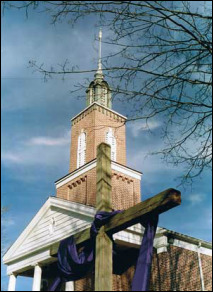 At First United Methodist Church of Rutherfordton, NC, we seek to offer Christ to our community through open hearts, minds and doors. We strive to intentionally invite, connect and nurture all who yearn for a deep and committed relationship with Jesus Christ. Through this active relationship and by God's grace, we all have the opportunity to live in a world full of God's blessings and promises. Remember, we are all on a spiritual journey. You are invited to find your path on the journey with us. Can't be here for a service? Watch online! Watch Sunday's sermon LIVE on Facebook OR catch it later by viewing the video on our Facebook page or YouTube channel. No need to miss out on a message again! Copyright 2018 First United Methodist Church Rutherfordton, NC. All rights reserved.